It is recommended that all those likely to encounter asbestos on the job undertake ASBESTOS AWARENESS AND MANAGEMENT TRAINING to ensure they manage it safely! 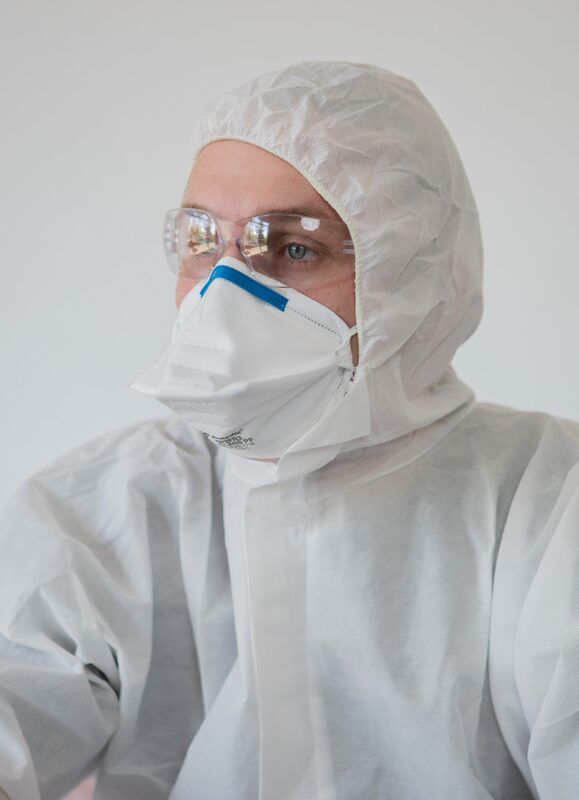 The most important thing in managing asbestos in the workplace is to minimise disturbing asbestos-containing materials to prevent releasing fibres that can be inhaled. All asbestos-containing materials and PPE Kits must be disposed of as asbestos waste according to regulations. Regulations on the removal of asbestos vary from state-to-state so for information on the requirements in your state or territory. Not all council waste sites are authorised to accept asbestos waste. Check with the relevant council for the nearest authorised asbestos waste centre or visit the Environment Protection Authority in your state or the National Online Database of Disposal Facilities. WHAT IF LOOSE-FILL (MR FLUFFY) HAS BEEN IDENTIFIED IN A PROPERTY? ONLY tradespeople trained in asbestos awareness can work on a building site that has been identified as containing loose-fill asbestos. NEVER enter ceiling or subfloor space in properties that have been identified as having loose-fill insulation. To check if a property might be located in an affected Council region before entering ceiling or sub-floor space contact the local Council, NSW Fair Trading Asbestos Task Force or the ACT Government’s Asbestos Task Force. Learn the areas in homes where asbestos is most likely to be found. Learn about the types of products that may contain asbestos. If you’re not sure if a product contains asbestos, assume it is asbestos and take all safety precautions. Before commencing work on a domestic property, create a Residential Asbestos Checklist For Tradies noting the various locations asbestos might be found, the types (fibro cement sheeting, vinyl floor tiles, eaves, roofing etc) and the condition it’s in so it can be managed safely. Tell the property owner and other workers to ensure everyone knows where asbestos might be found on the work site so it’s not disturbed. If working with asbestos, follow all recommended safety procedures to minimise the release of fibres. Always keep an Asbestos Personal Safety Kit on hand should ACM be identified in the workplace. 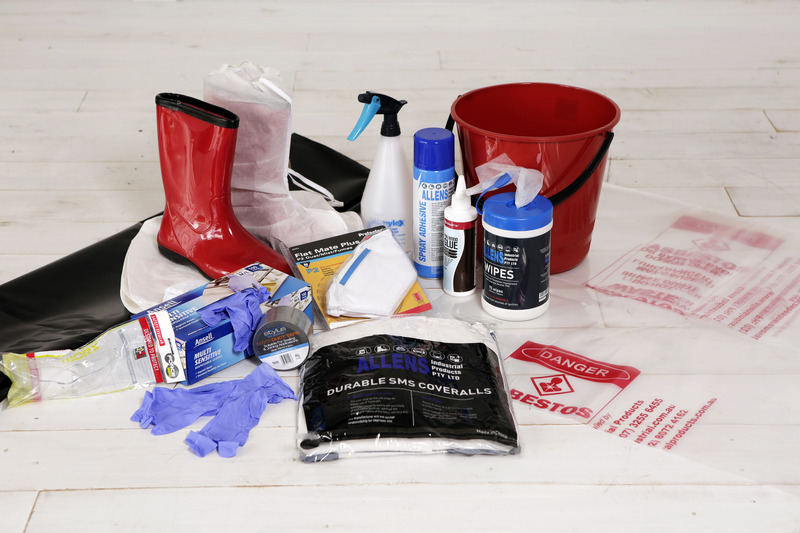 Make up your own Asbestos PPE Kit and think of it as your tools of trade. Download Fact Sheet T2 for full instructions. 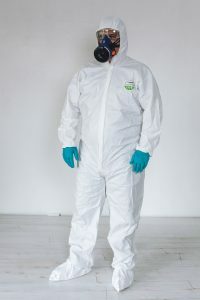 WEAR all items listed in the PPE Kit whenever working with asbestos. 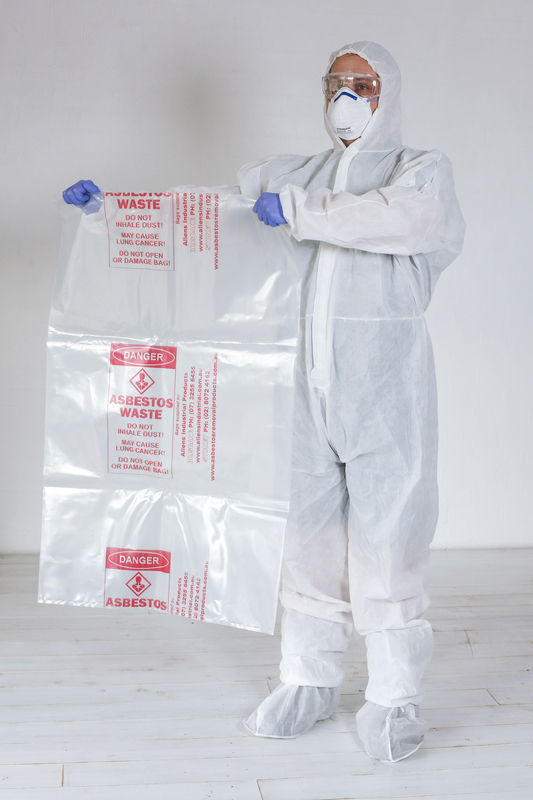 ALL items in a disposable PPE Kit must be disposed of as ASBESTOS WASTE after use. Should be rated Type 5, Category 3. Be labelled for asbestos use. Be one size too big to prevent breaking or tearing when worn. Include a hood and elasticised cuffs. Cuffs should be pulled over the edge of gloves. If the cuffs of coverall arms are loose, seal them with tape to prevent fibres getting in. After the shoe covers are fitted, ensure the coverall legs then go over the top of shoe covers. After the mask and eye-wear are fitted, ensure the hood goes over the mask straps and arms of eye-wear, and covers all hair. NEVER wear boots or shoes with laces as they can’t be decontaminated. GUMBOOTS are the best option as they are easily wiped clean and have no laces. Once cleaned appropriately they can be re-used for non-asbestos work. SHOE COVERS are worn OVER shoes and should cover all of the boot/shoe and be secured above the ankle. WHEN shoe covers are secured, pull the cuffs of the coverall legs down to cover the top of shoe covers. Use ONLY disposable Latex, Nitrile or neoprene gloves. Tuck under the cuffs of coveralls and tape the cuffs if loose. Your mask should be worn at all times when working with asbestos containing materials. Minimum P2 filter, half face disposable particulate respirator. Half face non-disposable particulate respirator with cartridge is preferred but it must be decontaminated after each use. 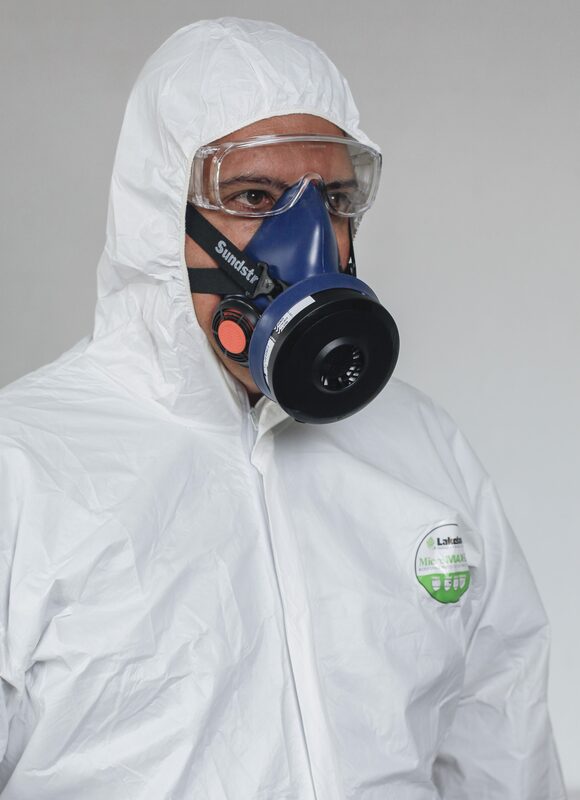 Half face non-disposable particulate respirator with cartridge is a better option. (Silicon is better than rubber) as fits better and not as hot. The wearer must be clean shaven in the area of the seal. fit to the wearer’s face. Ensure your mask fits perfectly by conducting a respirator fit check. 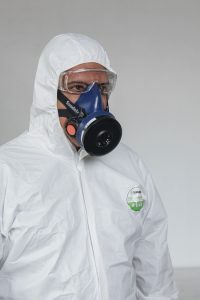 Disposable P2 half face particulate respirator & safety glasses. ALWAYS wear protective eye-wear when working with materials that might produce dust. AFTER fitting your mask, fit your eye-wear and place the hood over the top of the mask straps and eye-wear arms. It is recommended that only licenced asbestos removalist remove ACMs from any site and dispose of it according to regulations. However, if Tradies, handymen or workers need to maintain or repair some forms of asbestos in the course of their work, they must follow safety precautions and regulations. HOMEOWNERS should remove washing from clotheslines. Remove pets and pet bowls from work area. ENSURE no one else is near the area you are working in unless they’re wearing PPE. CLOSE all doors and windows to prevent drafts. TURN OFF all heating or cooling systems including fans and air-conditioning. COVER any surface in the work area that could become contaminated with fibres, dust and debris with plastic sheeting (200um drop sheets) and secure with duct tape. BEFORE STARTING WORK wear all your PPE gear! KEEP asbestos materials wet using a light mist spray. AVOID breaking asbestos materials during work. DO NOT leave the work area once work has commenced. If you must leave while work is underway, you must decontaminate yourself as per the following procedures and recommence work using new PPE. USE high pressure water spray or compressed air on any asbestos product inducing walls, fences and roofing as they can cause asbestos to become friable and it is prohibited under the WHS regulations. USE BROOMS OR BRUSHES except for sealing if using paint or a PVA glue solution. USE HIGH PRESSURE water spray on ANY asbestos product including walls, fences and roofing. USE HOUSEHOLD VACUUM CLEANERS. Only special H Class Asbestos vacuum cleaners are used by licenced removalists. ENSURE your PPE kit includes ALL items listed here. PLASTIC 200um in rolls for covering areas in the work space. DUCT TAPE for sealing bags and securely joining pieces of plastic from rolls. WET WIPES (preferred) or disposable cloths for decontaminating the area after the job is complete. BUCKET for wetting disposable cloths when decontaminating the area. WATER sprayer (hose or bottle) for wetting down asbestos materials. SEALANT (PVA glue) to mix 1 part per 5 parts with water to seal edges. NON-ELECTRICAL tools for removal of fixings and materials if required. PLASTIC BAGS to contain and seal in asbestos materials. These should be made of 200um (0.2mm) virgin plastic and be labelled/marked as ‘ASBESTOS WASTE’. If bags are unavailable, use 200um virgin plastic in rolls and label/mark as ‘ASBESTOS WASTE’. The easy to follow “Do’s and Don’ts” are available in the Residential Asbestos Checklist For Tradies. Power tools such as drills, angle grinders, circular saws and sanders. Brooms or other abrasive implements. Dust control hoods in combination with wet methods. Water spraying with PVA of asbestos material during work. Use of gels and pastes. Shadow vacuuming with a Class H approved asbestos vacuum. Designed to capture or suppress airborne asbestos. Used in a way that airborne asbestos is not generated. Any combinations of the above.